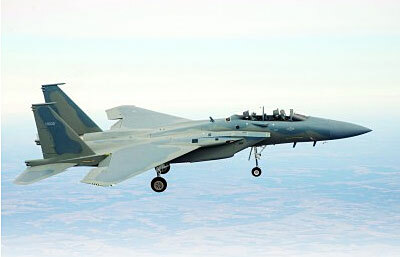 On 20 February 2013, an F-15SA advanced fighter aircraft destined for the Royal Saudi Air Force (RSAF) made a successful first flight out of Boeing’s St. Louis, Missouri facility. The flight went as planned, meeting all test objectives to support the on-schedule development of this new version of the F-15 Eagle. The F-15SA flight test program will include three instrumented F-15SAs flying out Boeing facilities in St. Louis and Palmdale, California. Deliveries of the new F-15SA aircraft to the Kingdom of Saudi Arabia are scheduled to begin in 2015 and conclude by 2019 when the last of 84 F-15SAs is to be delivered. “The successful first flight of the F-15SA is a tremendous milestone for the program and a testament to the relationship between the USAF, Boeing, and our RSAF partners,” said Lt. Gen. C. D. Moore II, commander Air Force Life Cycle Management Center at Wright-Patterson Air Force Base in Dayton, Ohio. “The F-15SA will add critical capability to the RSAF and enhance the security of the Kingdom of Saudi Arabia,” General Moore added. This new version of the F-15 Eagle features a Fly-By-Wire flight control system, enhanced situational awareness and increased survivability at a lower life-cycle cost, avionics advancements including a Digital Electronic Warfare Suite, an Infrared Search and Track system, and an Active Electronically Scanned Array radar. It has two additional weapon stations to provide its payload capacity. Its tandem seat cockpit features advanced displays and Joint Helmet Mounted Cueing Systems.